Our smart and stylish outdoor plant pots and planters are ideal as ‘statement’ planters at an entrance or for adding a contemporary touch to your outdoor space. Our exterior ranges include containers in real stone and in a variety of lightweight materials, with a large choice of shapes and sizes from very large tree planters to small planters suitable for a compact town garden. Allow around a week for UK delivery. 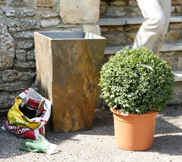 Our outdoor planter and plant pot range is perfect for those who like a high-quality appearance that is matched by unsurpassed longevity. Available in a range of sizes, from extra-small with an approximate height of 20 cm with a 5-litre volume to our large outdoor planters with an approximate height of 80 cm and volume of 72-litres, whatever your property and style, there is an outdoor planter and plant pot to suit. With an emphasis on long-term outdoor use without any compromise on style whatever the weather, all of our items are frost resistant and come complete with drainage hole. Making them perfect for all year-round use, our specially chosen range includes tapered, conical, trough and square with finishes from graphite to granite to slate. The result is an outdoor planter or pot that has a highly modernised look that is perfect for today’s homes or stylised business premises, helping to enhance the look of any outdoor or indoor space. Perfect for smaller areas such as doorways and paved areas, our range is also ideal for larger gardens and patio areas, creating interest and a contemporary feel.